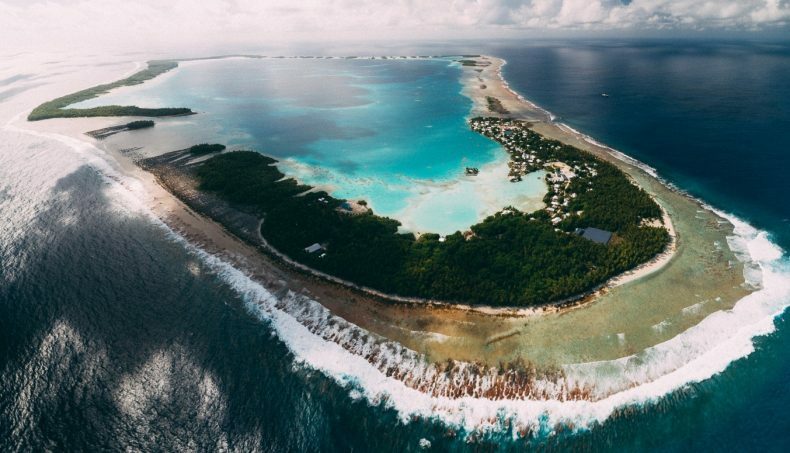 The Pacific island nation of Tokelau is one of the most remote places on the planet, and, with the entire country sitting metres above sea level, one of the most under threat from climate change. Media creator Kate Whitley describes the journey to this vulnerable ‘necklace of small islands’. In November 2017 a small group from Te Papa including scientists, curators, and media creators journeyed to Tokelau – a group of three, low-lying, coral atolls in the Pacific. Our remit was to collect cultural objects and intangible knowledge and stories relating to those items, with the aim to record the voices and views of the people in a very real and honest way. The objects collected on this trip form part of a co-collecting initiative which encourages communities to play a greater role in representing themselves through telling their stories and selecting objects which reflect their cultural diversity. The initiative is designed to explore how these communities live with and responding to climate change, as well as exploring indigenous knowledge. Our team set off from Apia, Samoa, on board our vessel, the Mataliki, following a brief dengue fever check and very rudimentary immigration procedures conducted in a small shed in the port alongside our vessel. 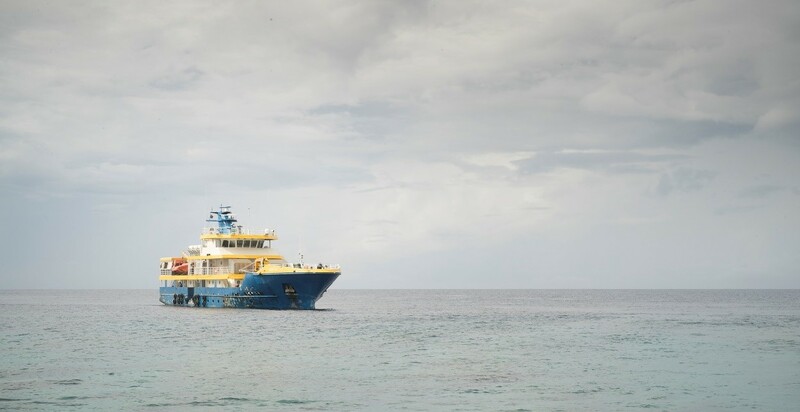 The ship delivers valuable supplies to Tokelau as well as ferrying passengers. Some of the young people we spoke to on board were returning home for Christmas from Fiji, where they are studying at the University of the South Pacific – a journey involving more than 24 hours aboard a ship and a flight from Fiji to Samoa. For the students, it’s a once-a-year trip and there’s a sense of happiness on board as they return to family in Tokelau. 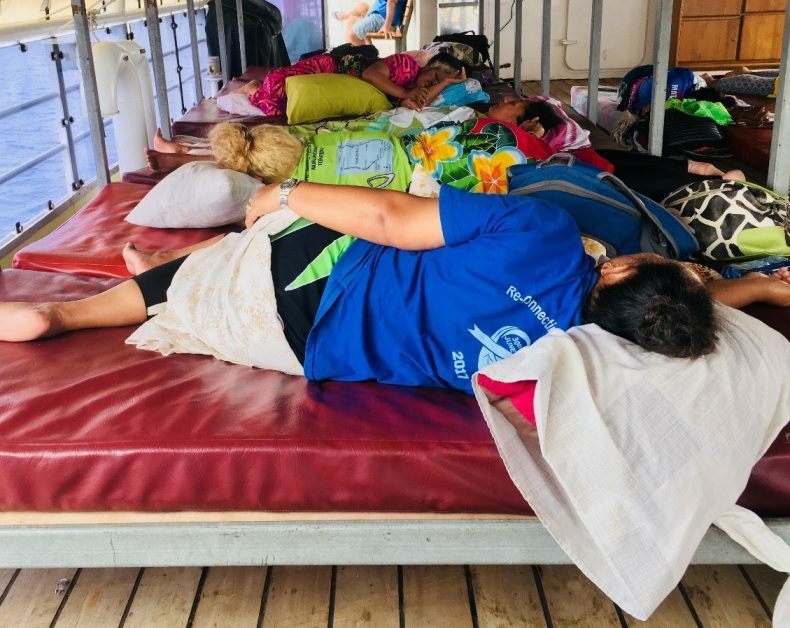 Once aboard, the locals rushed to claim the mattresses on deck, where many of them spent the majority of the trip snoozing amidst a swathe of brightly coloured lavalava (sarongs), the preferred garment to sleep in. The smoking area was adjacent to the mattresses, separated not by walls but by a strip of red tape, so most of our party headed below deck to the air-conditioned bunkrooms. Life on the ocean poses many challenges. Showering or using the bathrooms on board a constantly rolling ship is an art in itself, and mealtimes were a marvel to observe as the ship’s crew wandered around with a huge teapot full of Milo for the passengers. How they managed to pour hour liquids perfectly into a mug without falling over or scalding adjacent passengers is still a mystery. As the islands of Samoa receded, vistas of endless ocean and vast skies provided ample time for contemplation, horizon-gazing, and cloud-studying. We strained our eyes for the slightest sign of a whale blowing or a fin or tail breaking the surface, but saw only a very occasional seabird and little else. After more than 24 hours at sea, a small, low-lying atoll emerged as though a mirage. The first of three atolls that make up the New Zealand protectorate of Tokelau appears suddenly. It strikes me just how vulnerable and remote these islands are – a necklace of small islands in the midst of a vast ocean. It’s difficult to imagine how the people of Tokelau cope with storm surges let alone with rising sea levels. The highest land is less than a few metres above sea level. At points around the atoll, there is only low-lying coral and sand separating ocean waters from the sanctuary of the lagoon within the atoll. Most striking was the width of the land fringing the lagoon – in some areas both the sea and the lagoon are clearly visible from the atoll, with only a football pitch-sized strip of land separating the two areas of water. Despite the geographical isolation and the vulnerability of the atolls, they host quite developed villages and there is reasonable infrastructure including a hospital and large school on one island. Efforts to resist the increasing storms include sea-walls being built around parts of the atolls. Despite these efforts, locals speak of waves which wash over the island to the lagoon beyond, damaging crops and infrastructure and contaminating fresh water. In some areas, houses are raised on stilts with rainwater tanks beneath. Once on the island we meet with the co-collectors; members of the community who describe what is being done to live with the effects of climate change, and who have selected objects for us to bring back to Te Papa. Tokelauans are warm, hospitable people who, although shy at first, are keen to share their stories. They proudly tell us of the efforts to resist the sea with the sea walls, and talk of the huge change to life the solar power station has made with electricity being available 24/7. A recent delivery of building materials means workers are busy developing what looks to be a new municipal building and houses feature televisions, computers, and fridges – all made possible with the advent of constant electricity. There seems to be a steady rate of progress, of industry. Tokelauans remain optimistic about their future in spite of global predictions for rising sea levels which will spell disaster for the atolls. Some locals though, demand an answer. The teacher of the primary school, upon seeing us, asked us what is being done. She says her students are asking about their future. What can we say? What will the future look like for Tokelauans and their children? The day we visited the sea was calm and the atoll appeared as though on a postcard, but the sea wall only seemed a temporary measure against an insurmountable problem. 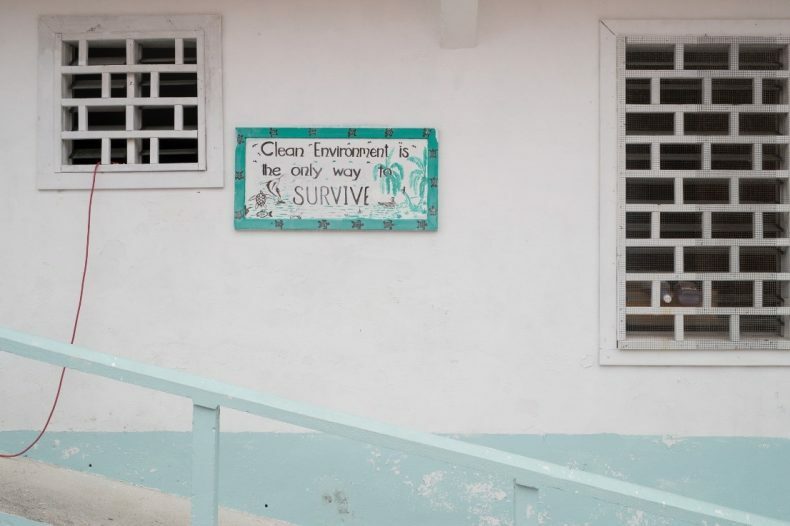 Perhaps this notice, posted on the side of a public building in Atafu is a message to us all: [A] Clean environment is the only way to survive. omg i live in California and my first thought is get these people off that island…this is so scary for them…what is going on with our enviroment is not worth their lives…why can’t the government find a suitable island that is higher up for them or combine them with another island and get them situated? This is very sad to me…i fear for them and their way of life…the ozone layer is only getting worse which means more sea water…i pray that it changes and their children see a life off this island somewhere safer. Thanks Kate Whitley for your honest opinion about our dear homeland Tokelau. Great to read the latest stories of what’s been happening with Tokelaua especially climate changes which I guess the most fearful current issue facing Tokelau now. Nice pictures. What a wonderful read. Thanks for taking the time to undertake this really important work. Well done.. I would like to see more about Tokelau and the effects of global warming. Have they already been impacted? How do they propose to combat it in the future? Hi Cary, Tokelauans spoke to us of the very real impacts of climate change on their lifestyle. We hope to publish more on this but in the meantime, the Tokelauan government have a section on their website which reports on how they are responding to the challenges: https://www.tokelau.org.nz/Climate.html . Thanks for your interest – it’s a pressing concern for many islands in the Pacific. Thank you for the blog. Enjoyed. Thank you for the blog. Please blog again when you have had a chance to catalogue and photograph everything you have collected. It will be great to know what stories, intangible heritage and objects you have collected. Thanks Don. We hope to be able to showcase some of the material we collected so please keep an eye on the blog! Great article – helps understand ( in a very real way) the issues these islanders face with global warming etc. Did you collect much? Any images available ? How many people live there permanently? Thanks for your feedback Tony – it was an incredible experience to be able to see, first-hand, the challenges these islands face. We brought back a small collection of objects with us, along with video stories and photos. Hopefully we’ll be able to share those with our audiences in future. I can’t tell you exactly how many people live across the three atolls but believe it’s approximately 1500 people.